-Read the media bias example below (from a Dec. 3 post by Matthew Sheffield at newsbusters.org). Not only that, despite the Obama Administration’s claims that it met its November 30 deadline to have things fully operational, it turns out that much of the software code that operates away from website users and passes their information along to insurance companies has not even been written. That might explain why on Monday the White House refused to say how many people had actually been able to sign up and enroll in an insurance plan although it did tout repeatedly that 375,000 people had visited the Healthcare.gov website before noon Eastern Time on Monday. The week QSSI took over [at the behest of administration official Jeffrey Zients], HealthCare.gov – a site Mr. Obama once promised would be as easy to shop on as Amazon.com – went dark for 10 to 12 hours, unheard of in the online business world. But the bigger problem was organizational. But while the contractors were grateful to Mr. Zients for helping to create order, they saw the administration’s “tech surge” – announced by Mr. Obama in the Rose Garden a few days before QSSI took over – as mostly an exercise in public relations. 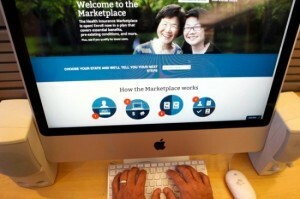 Important pieces of the Obamacare site are still glitchy, or missing altogether. And the site’s botched rollout is hardly boosting confidence in the vital components that still need to be built, including the systems for processing payments to insurers and squaring away the details of who has enrolled in which plans. Both systems are crucial to the insurance industry, which needs to collect premiums so it can pay out claims. And carriers are still waiting for the delayed process of reconciling their enrollment information with the federal government’s data. As the rest of HealthCare.gov struggles to get off the ground, people in and near the insurance industry are nervous about the delays and about how well those systems will work once they’re in place. “They don’t have a very good track record of building and testing systems, given what we’ve seen so far, so that is cause for concern,” an industry official said. Another cause for insurers’ anxiety: CGI Federal – the contractor that has come under fire for its work building the bulk of HealthCare.gov – is also in charge of building the payment and reconciliation systems. Reconciliation is the process by which insurance companies and the federally run insurance exchange iron out any discrepancies in enrollment information—making sure, for example, that the same person isn’t accidentally enrolled in two policies, and that the consumer and the insurance company got the same information about the size of any subsidies. Consumers have to pay their first month’s premium by the end of December for their coverage to take effect on Jan. 1. And to make sure that the right people are paying the right amount for the right policy, insurers and the government need to reconcile their information. The process was supposed to start this month, but insurers are now skeptical that will happen. And they haven’t gotten word of any backup plan. Given the partiality of the national media, one cannot help but wonder whether this information will be extensively reported on the broadcast evening news shows or the homepages of major websites like CNN or Yahoo, the places where most people get their political information. While the front-end of the exchange website appears to be mostly working, it is simply not true to characterization as a “deadline met” as CNN called it yesterday. While the problems with Healthcare.gov are likely to be fixed at some point in the future, it is unclear now when that will be. It could take months to get things fully operational which would mean that there will likely be plenty of citizens who will have to pay a penalty for not carrying insurance even if they had actually signed up on an exchange website. CGI Federal – the contractor that has come under fire for its work building the bulk of HealthCare.gov – is also in charge of building the payment and reconciliation systems. How many news reports on these problems have you heard/read about in the past week, or at least seen headlines pertaining to these stories? 2. Do you think the media is displaying bias by not widely reporting on the major problems with the ObamaCare website? Explain your answer. 1. Opinion questions. Answers vary.